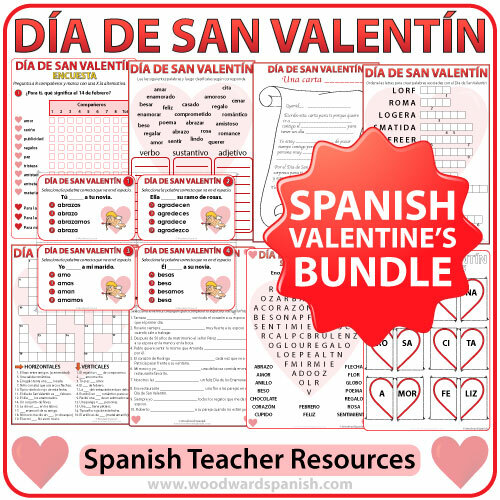 Valentine’s Day Bundle of Spanish Teacher Resources. Actividades acerca del Día de San Valentín para profesores de español. 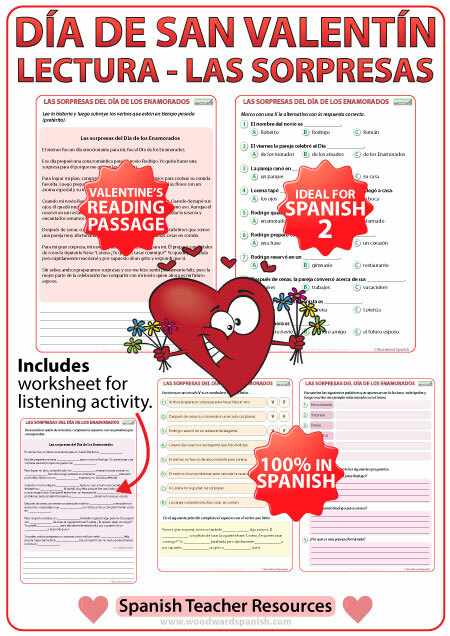 This bundle contains resources about Valentine’s Day in Spanish for teachers and parents. 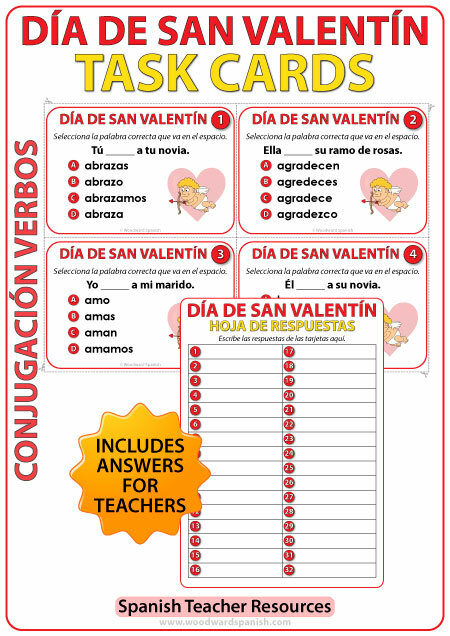 32 multiple choice task cards to practice the conjugation of Spanish verbs associated with Valentine’s Day (Día de San Valentín). In this set, all of the verbs are in the present tense (presente de indicativo). 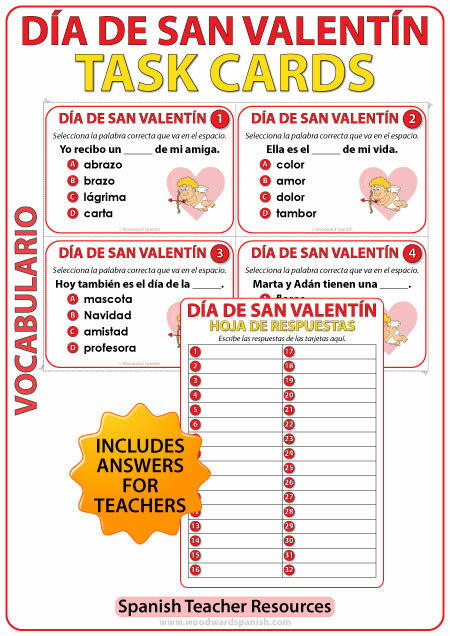 32 multiple choice task cards to learn Spanish vocabulary about Valentine’s Day (Día de San Valentín). In this set, all of the choices are NOUNS. Students need to complete the blank space in the sentence by choosing one of the Spanish nouns from the multiple choice section. The sentences are all in the simple present tense. 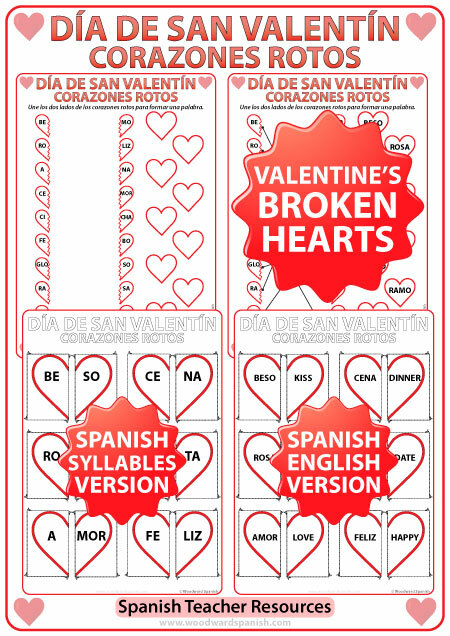 This pack contains Spanish Vocabulary about Valentine’s Day and fill the blanks (cloze) activities using that vocabulary. The activities are aimed towards Spanish 3 students or Spanish 4 students doing a review. Two Letters in Spanish that a couple wrote for Valentine’s Day. One of the letters is romantic, while the other is crazy (not at all romantic). 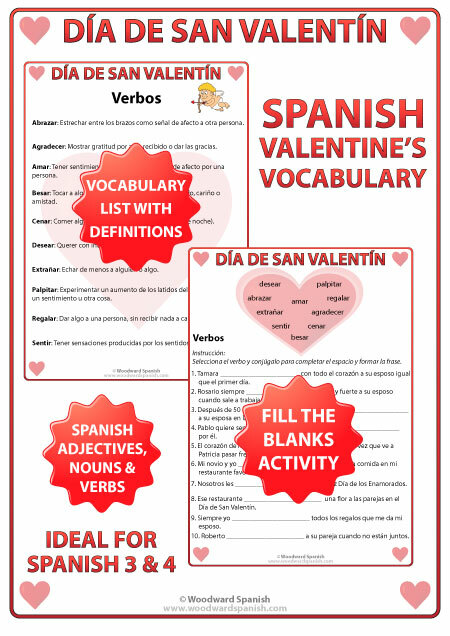 There is also another letter with some of the spaces blanked out (some adjectives and nouns) so that students can fill the gaps to make their own Valentine’s letter, either for a friend or someone they like (imaginary or not). 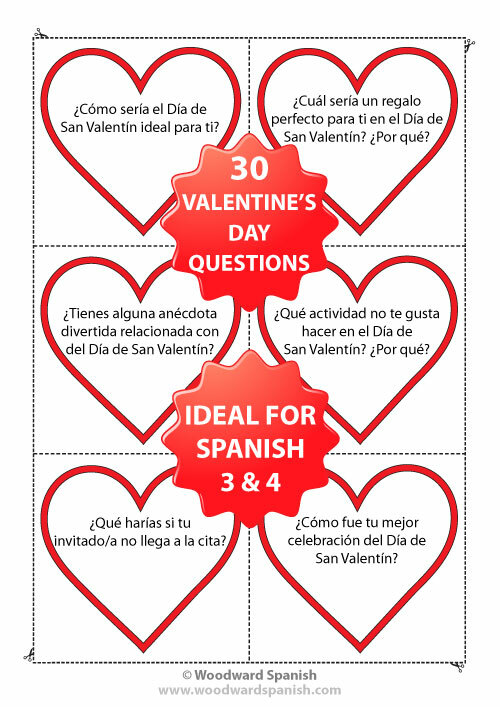 30 Spanish Conversation Starter Cards with questions associated with Valentine’s Day. The cards are ideal for students at Spanish 3 or Spanish 4 level since some the questions use the conditional and because of the vocabulary needed to respond them. 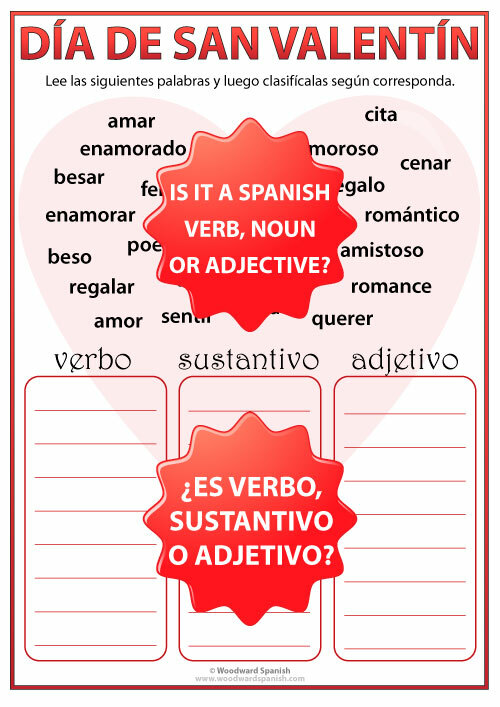 Valentine’s Day Spanish Worksheet – Verb, Noun or Adjective? 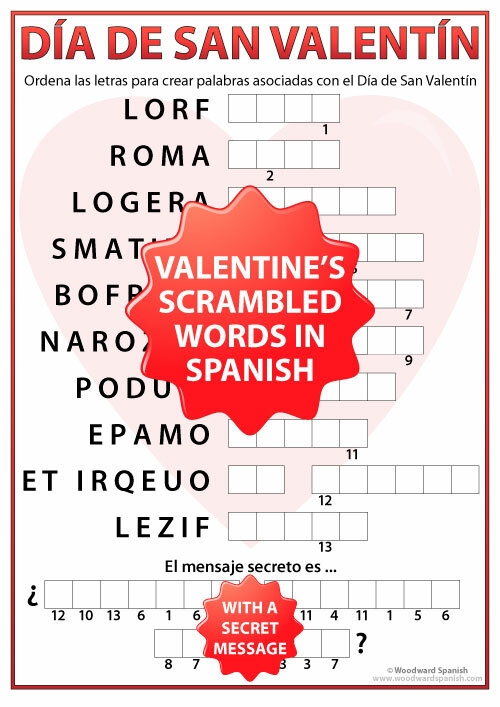 Scrambled Words Worksheet containing Vocabulary associated with Valentine’s Day in Spanish. Once the words have been unscrambled, student use certain letters from each of those words to complete a secret message. A Reading Passage in Spanish about the surprises a couple had for each other on Valentine’s Day. The text is in the past tense (pretérito) and includes comprehension questions. Includes listening activity. Flash cards for English speakers learning Spanish. Students will need to join the left side of a heart that has a word in Spanish with the right side of the same heart with its translation in English. The second group of flash cards have the Spanish word divided into its two syllables. Students need to join both sides of the heart to make a word associated with Valentine’s day. The third activity is a worksheet with the same 10 words divided into their two syllables as above. Students need to draw a line between the two syllables that make a word. Then they can write the complete word in one of the blank hearts to the right. There are two versions of the crossword. One is completely in Spanish without any English on the worksheet. 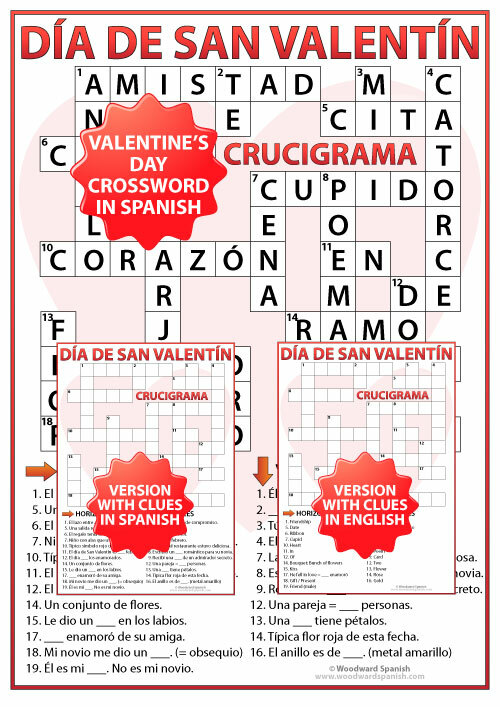 The other version has the clues in English which students need to translate into Spanish to complete the crossword. 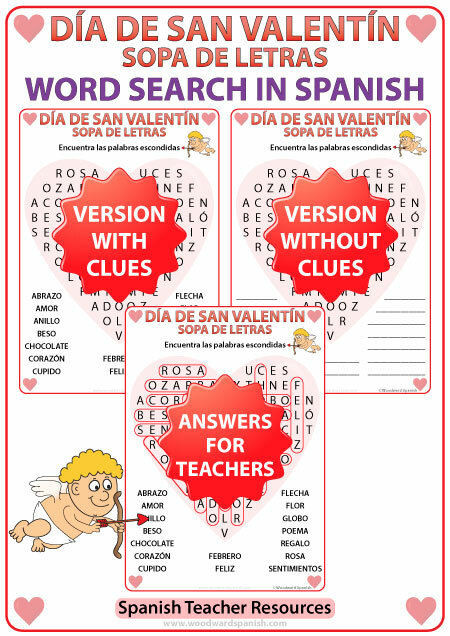 A word search with vocabulary about Valentine’s Day in Spanish. There are two versions, one with clues of the words they need to find, and the other is without clues with a space for students to write the words they find. This resource is to get to your students speaking to each other in Spanish. 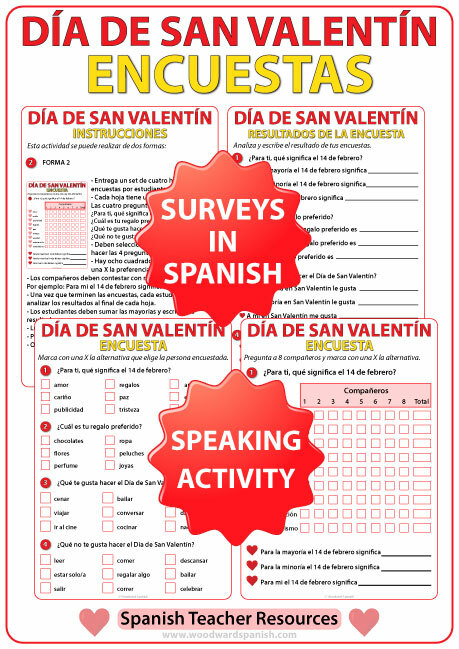 The activity involves having each student ask other (up to 8) students questions in Spanish in order to complete a survey about Valentine’s Day. 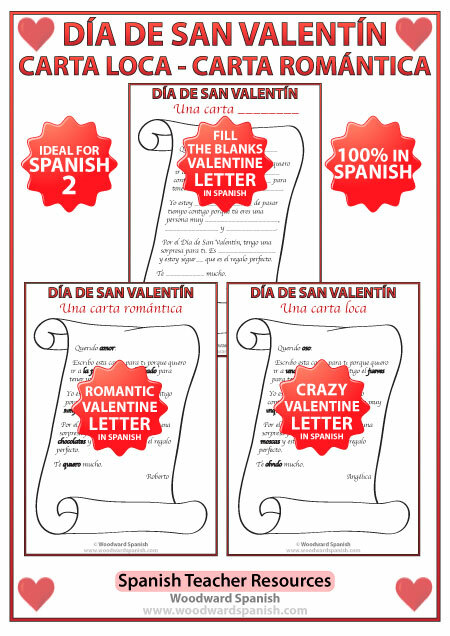 Un paquete de actividades acerca del Día de San Valentín (Día de los Enamorados).